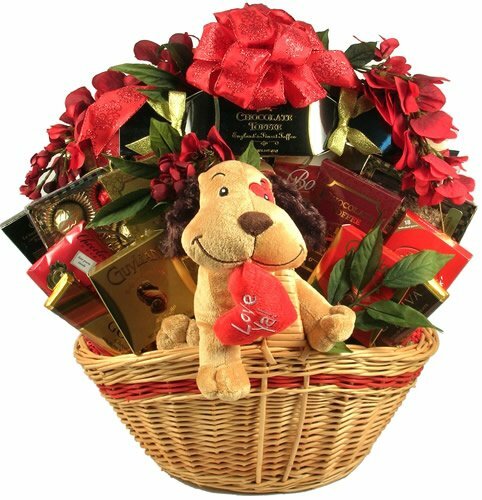 They are going to absolutely luv this stunning gift basket, filled with an abundant selection of gifts and goodies for them to enjoy. It includes "patches" a sweet pup holding a "luv ya" heart in his mouth Godiva milk and dark chocolate bars a gourmet dark chocolate "love letter" bar with cherries and almonds (includes a love poem) "England's finest" chocolate toffee foil wrapped chocolate covered cherries a gourmet chocolate graham with caramel and marshmallow milk chocolate covered, peanut butter filled, pretzel nuggets butter crunch almond toffee a lindt milk chocolate bar butter crunch toffee with cashews almond tea cookies sea salt caramel dipping cream/sauce salted caramel chocolate cookies chip-zel-pop (gourmet mix of chips, pretzels, popcorn, caramel and white and dark chocolate) triple chocolate hot fudge brownie an assorted box of individually wrapped "bonbonetti" chocolates with coconut, tiramisu and hazelnuts/milk chocolate caramel hearts rich French truffles Belgian chocolate seahorse truffles a delicious chocolate covered berry mix when you really want to make an impression, this is the gift basket to send. Meet Patches, our adorable plush with a pillow that reads "Love Ya"